Provides a self-contained description of this important aspect of information processing and decision support technology. Presents basic definitions, principles, applications, and a detailed bibliography. Covers a range of real-world examples including control, data mining, and pattern recognition. SANKAR K. PAL, PhD, is a Distinguished Scientist and founding head of the Machine Intelligence Unit at the Indian Statistical Institute, Calcutta. Professor Pal holds several PhDs and is a Fellow of the IEEE and IAPR. SIMON C. K. SHIU, PhD, is Assistant Professor in the Department of Computing at Hong Kong Polytechnic University. 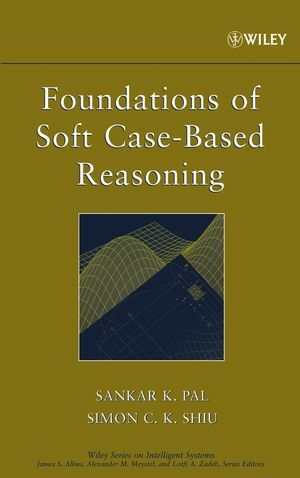 1.2 Components and Features of Case-Based Reasoning. 1.2.1 CBR System versus Rule-Based System. 1.2.2 CBR versus Human Reasoning. 1.3 Guidelines for the Use of Case-Based Reasoning. 1.4 Advantages of Using Case-Based Reasoning. 1.5 Case Representation and Indexing. 1.8 Case Learning and Case-Base Maintenance. 1.8.1 Learning in CBR Systems. 1.9 Example of Building a Case-Based Reasoning System. 1.10 Case-Based Reasoning: Methodology or Technology? 1.11.4 Some CBR Tasks for Soft Computing Applications. 2 CASE REPRESENTATION AND INDEXING. 2.2 Traditional Methods of Case Representation. 2.2.4 Comparison of Case Representations. 2.3 Soft Computing Techniques for Case Representation. 2.3.1 Case Knowledge Representation Based on Fuzzy Sets. 2.3.2 Rough Sets and Determining Reducts. 2.3.3 Prototypical Case Generation Using Reducts with Fuzzy Representation. 2.4.2 Case Indexing Using a Bayesian Model. 2.4.3 Case Indexing Using a Prototype-Based Neural Network. 2.4.4 Case Indexing Using a Three-Layered Back Propagation Neural Network. 3 CASE SELECTION AND RETRIEVAL. 3.2.2 Hamming and Levenshtein Distances. 3.2.3 Cosine Coefficient for Text-Based Cases. 3.3 Concept of Fuzzy Sets in Measuring Similarity. 3.3.1 Relevance of Fuzzy Similarity in Case Matching. 3.3.2 Computing Fuzzy Similarity Between Cases. 3.4 Fuzzy Classification and Clustering of Cases. 3.4.1 Weighted Intracluster and Intercluster Similarity. 3.4.2 Fuzzy ID3 Algorithm for Classification. 3.4.3 Fuzzy c-Means Algorithm for Clustering. 3.5.1 Using Gradient-Descent Technique and Neural Networks. 3.6 Case Selection and Retrieval Using Neural Networks. 3.7 Case Selection Using a Neuro-Fuzzy Model. 3.7.1 Selection of Cases and Class Representation. 3.7.2 Formulation of the Network. 3.8 Case Selection Using Rough-Self Organizing Map. 3.8.1 Pattern Indiscernibility and Fuzzy Discretization of Feature Space. 3.8.2 Methodology for Generation of Reducts. 4.2 Traditional Case Adaptation Strategies. 4.2.4 Example of Adaptation Knowledge in Pseudocode. 4.3 Some Case Adaptation Methods. 4.3.2 Integrating Rule- and Case-Based Adaptation Approaches. 4.3.3 Using an Adaptation Matrix. 4.4 Case Adaptation Through Machine Learning. 5.3 Types of Case-Base Maintenance. 5.4 Case-Base Maintenance Using a Rough-Fuzzy Approach. 5.4.1 Maintaining the Client Case Base. 5.5 Case-Base Maintenance Using a Fuzzy Integral Approach. 5.5.1 Fuzzy Measures and Fuzzy Integrals. 5.5.3 Fuzzy Integral–Based Competence Model. 6.2.1 Case Representation Using Fuzzy Sets. 6.2.2 Mining Fuzzy Association Rules. 6.3.2 Case Retrieval Using a Fuzzy Neural Network. 6.3.3 Case Evaluation and Adaptation Using Induction. 6.4.1 Structure of the Hybrid CBR System. 6.4.2 Case Adaptation Using ANN. 6.5.1 Fuzzy Logic in Case Representation. 6.5.2 Fuzzy Similarity in Case Retrieval and Inference. 6.6.2 Fuzzy Preference in Case Retrieval. 6.7.1 Structure of a Hybrid CBR System Using Gas. 6.7.2 GA in Case Indexing and Retrieval. 6.8.1 Structure of the Color-Matching Process. 6.9.2 Neural Networks in Retrieval. A.3 Operations on Fuzzy Subsets. A.5.2 Fuzzy Rules for Classification. B.1 Architecture of Artificial Neural Networks. B.2 Training of Artificial Neural Networks. B.3.2 Multilayered Perceptron Using a Back-Propagation Algorithm. B.3.3 Radial Basis Function Network.